Contents and Media: Waterslide decals and illustrated instructions. Advantages: Highly quality decals; interesting subjects; excellent artwork. Conclusion: Well researched, perfectly thin in register decals, and an excellent overall presentation. British airplanes to me have never been really colorful, even the beautifully elegant Spitfire seems, well to put it bluntly, boring. Then I got this wonderful sheet from Lifelike. Designed for the Heller Mk.XVI, these four aircraft are quite colorful. This is sheet is a re-release. First off the there is the overall light blue aircraft of Air Vice Marshall Sir James Robb. This beauty is simplicity at its finest. Between the pennants, stars and the British roundels this ‘plain’ powder blue aircraft is really nice. Aircraft two is a ‘typical’ Spitfire with some unique nose art belonging to Squadron Leader Raymond Lallemant of the Belgium Squadron. The rooster and the personal markings make it less typical aircraft finished in Dark Green/ Ocean Grey/ Medium Sea Grey with Sky code. Aircraft three displays the roundels of the Belgium AF with the Dark Green/ Ocean Grey/ Medium Sea Grey. The roundels and red spinner are what add the color to this aircraft. I think it just looks ‘cooler’ than a British Spit. The final aircraft is an overall Gloss Black personal hack for Air Officer Commander. Yellow wingtips and spinner along with the lightened blue and red make this aircraft quite unique. The Lifelike instructions are included on two 8 x 10 sheets in full color. The profiles are included on one sheet as well as the stencil data. The other sheet has the interpretation of the colors, references, and the plan views and the other side codes not in the profiles. This all makes for a very well researched decal sheet. The decals themselves are perfectly printed and in register. They also have excellent color saturation. Two sheets are included. 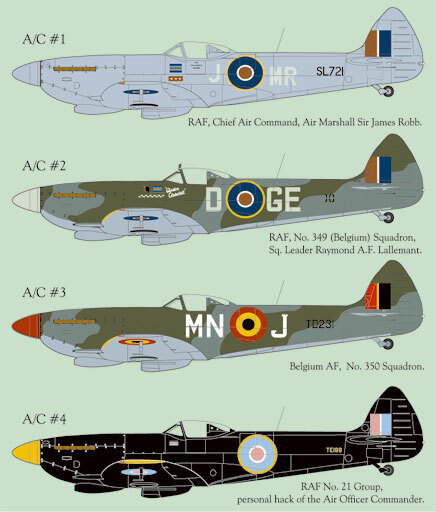 The first one is full of the color markings including the roundels. The other sheet is all the stencils in black. You get enough stencils for one complete aircraft. I really like the research and the way it is presented. These decals don’t tout to know everything on these aircraft. What isn’t known is presented as an unknown. I think this is an excellent way to present the decals. Well researched, perfectly thin in register decals, and an excellent overall presentation. These are what I like my decals to be. These are just typical of the quality from Lifelike. Thanks to Keishiro Nagao of Lifelike Decals for the review sample.